Are you still choosing a personal trainer certification, and wonder why you should choose NFPT? In this list of Top 10’s, we give you some of the most popular reasons that fitness enthusiasts choose to join the NFPT family of trainers, and it’s not just because we’re fun people! NFPT Education is delivered through the Personal Trainer Manual and several supplemental resources to assist you with comprehension of the manual and thorough test prep. 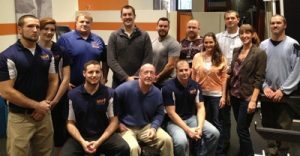 Our trainer manual is a step-by-step guide through anatomy, physiology, fitness components, client screening and assessments, injury treatment and prevention, business and professional considerations. You will use this manual as day-to-day guide in your work as a personal fitness trainer. With NFPT there are a lot of ways to get Continuing Education Credits (CECs). Basically, any fitness learning activity that you participate in will get you credits towards your recertification. You can submit coursework or proof of event participation, even your CPR/AED card, and you'll get credits for it. We also have in-house free CEC offers throughout the year that will get you all of the credits you need to renew. The difference between us and other certifiers? We make recertification affordable and convenient. And no other certification provider gives you free CECs for the life of your certification! NCCA Accreditation is an achievement standard by which our industry qualifies certification programs as being reputable and recognized by peers and employers. NFPT was established in 1988. We’ve been certifying fitness professionals since before the world wide web! NFPT certified its first fitness trainer in 1988. NFPT’s Personal Trainer Certification program became accredited by the National Commission for Certifying Agencies (NCCA) in 2005. For 30+ years, we've offered a foundational education and credential to those who seek personal fitness trainer employment in gym facilities, private studios and other fitness capacities around the world. As a current employee of any health club or fitness facility, receive a 10% discount on the Standard or Premier Certification package. As an active or veteran military service member (or military spouse! ), or any position in civil service (i.e. police officer, fire fighter, EMT), we salute you and are grateful for your service, every day. You receive a 15% off cert package discount (and you can use your military G.I. Bill for full reimbursement benefits). Get started on your career in fitness! Schedule your certification exam by appointment at any of over 400 computer locations, or you can take the paper/pencil exam with a certified proctor. Convenience around your schedule. There are no surprises with NFPT, you get what you need and don’t pay for anything else. Okay, that’s two reasons, but they are closely related. With NFPT, there aren’t surprises. You get what you need to get certified, and you won’t pay more for stuff you don’t need. We are up-front about the cost of certification and what it takes to get re-certified each year. Keeping it simple. Being successful in a profession that you're passionate about requires validating your knowledge. That's what taking the NFPT CPT exam is all about. When you pass our test, you earn the title of Certified Personal Trainer, CPT. Your NFPT - CPT title is one that you can be proud of and put to work immediately. NFPT’s recognition extends into our partnerships and relationships with leading health and fitness organizations. From medical fitness connections, industry-wide database listings and job searches, discounted liability insurance and more, we have you covered or connected for discounts on tools and resources. Our friends are your friends. THE PEOPLE. YOUR FITNESS TRAINER FAMILY. We saved the best for last. 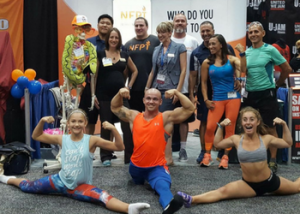 NFPT is family owned and operated, and you'll be part of our FitFam! We enjoy interactions with our trainers and we work each day to support anyone seeking guidance and certification service. We answer the phone. We answer your questions. Whether you’re taking a baby step or a giant leap, we’ll be here to support your efforts. We’re here to make sure that you have the tools for learning and the credential that you need to be successful in your work, before, during and after you’re certified. This is a user friendly company! Their CPT course is in layman’s terms and easy to follow. 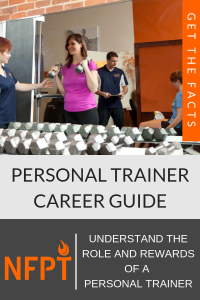 It equips you with just the right amount of information to get started as a personal trainer. Then there’s all sorts of Continuing Ed options to build upon the foundation. I have been a Certified Personal Trainer since 2009. I originally certified with another nationally accredited certifying body. Switching to NFPT was the best move I ever made. They are a family owned company that cares about my success. Whenever I have any questions about the industry or any aspect of fitness training someone is always eager to assist me. They allow me to be directly involved! Being a personal trainer has been the most rewarding career choice I’ve ever made. After 25 years of acting and entertainment, I met a personal trainer with the NFPT, his knowledge was amazing. I investigated the many affiliations but none of them offered what the NFPT did. I feel blessed to be a part of such a committed organization! After calling several other certification companies, most seemed cold over the phone and always tried to say they were the best. Not with NFPT! They were honest and down to earth. I know other people who are certified with other companies and they seem dissatisfied when talking about what their companies do for them. This guide is super helpful. And, it’s FREE. Thank you for your interest in becoming a personal trainer! Check your email. The guide is on the way.